Bruce Cowan is probably the most dedicated and stoked mat aficionado that I have ever known. 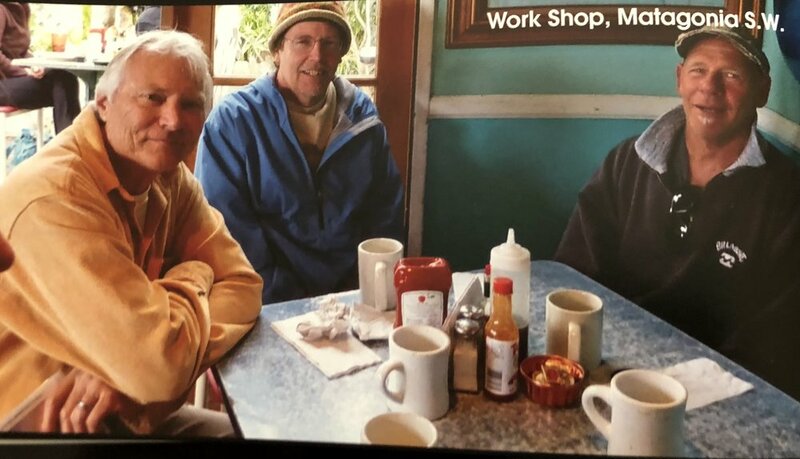 Poet, adventurer, keen observer of society, music man, loving husband, not to mention proud Pop and Grandfather, Bruce has definitely been around the surf block. Growing up in Southern California, Mr. Cowan has surfed it all in one form or another and has a huge ocean oriented history. He is respected anywhere he surfs for his skill and his keen eye for waves and mat equipment. He has ridden just about every mat style made. He knows his stuff. His view of our mat world is honest and always refreshing. Bruce boasts the moniker, Pranaglider with a gleam in his eye and his tongue firmly ensconced in his cheek. He authors one of the most original blogs ever in water sports and its periphery, dubbed, 23 Breaths. 23 Breaths is all fun, music, mats and no drama. This is a web spot that opens the way for all of us to view our lifestyle in a most interesting mode, one that actually makes you think and more often than not, SMILE! So just who is Pranaglider and where does his cosmic Sanskrit name originate? And just how does it equate to riding our soulful mats? To start with I asked Mr. Bruce Pranaglider Cowan about his house, garage and car full of swim fins, so essential to riding mats. Carefully broaching the topic, I ask, Have you tried a lot of different fins? KM – Aside from riding mats, do you study them as well, I mean really study them? Do you watch videos or review still photos of others riding mats? Bruce – Absolutely! Mat Obsessive Disorder is a cruel result. I’ve got it bad. KM - Do you find it difficult to tell others that don’t mat what this bag of air is all about and why it is so much fun? Bruce - Almost impossible. I don’t get invited back to many cocktail parties if I go on a rant. I will sort of float it out there and if I get an I used to ride those back in the day response then I will corner the poor sucker for hours. KM - How hard was it for you to ride a mat initially? Bruce - I believe Greenough said that a mat is the easiest thing to ride and the hardest thing to ride well. So I watched the Greenough videos and anything else I could find quite literally a million times, all whilst enduring the abuse of the locals. Excuse me but is that an inflatable dog bed you’re riding? My problem was twofold. First, in my previous experiences the mat was fully inflated. With the modern mats I think they work best at lower inflations. James Mattitude Sowell clued me in on that. Actually, we traded mats. In my case, the clouds opened and I suddenly got it. You reshape your mat as you ride, so it can’t be fully inflated. Thanks James! The question is how much air do you want. The answer is it varies. When I first inflate my mat I usually over inflate. The air out of my lungs is warm so when I get in the water it’s going to cool and shrink. Less inflation. Once I get outside I have a better idea what the waves are like and I can adjust the volume. If it’s big I go with less air for the paddle out. It is so much easier to duck dive. Few things harder than paddling a very inflated mat out in big sets… The second problem was, while I had lots of experience standup surfing, the leash made my bodysurfing skills rusty. Leashes ruined surfing! Mat riding is bodysurfing, Just faster and sometimes much faster! This is why riding a mat is hard to teach. It’s very subtle. An explanation comes off as too crude (just catch the wave and turn) or too nuanced (twist your body counterclockwise around your core while simultaneously lifting the front outside mat corner and engaging the fin rail of your inside fin). The best way to learn is to go surf with your friends and pay attention. All will be revealed. KM - Did you get the magic right out of the gate or was there a steep learning curve? Bruce - I know what you are asking, and my answer is yes. But now let me reframe the question by defining what we mean as the magic. So to summarize, I moved to a beach city as a child and went to the beach a lot. Later I grew up, got married, had kids and had a so called career. But I didn’t go to the beach as much. So without knowing, it I was searching for that magic, looking to reconnect and go back to those simpler times. So I got a mat. But a mat is just a thing and isn’t going to change anything. The treasures of the house do not come in via the front gate. But in trying to figure out how to ride this thing I gave up my notions of what surfing is. I had grown up pouring over the magazines and had bought into the lifestyle portrayed therein. But that’s not surfing. It’s one view of surfing as portrayed by some advertisers in order to make people buy their products. So what is surfing? An excellent question and one that has a different answer for everyone that asks it. For me it starts with watching the weather maps. The waves we ride start as winds in a storm blowing across open water, that’s the fetch. So maybe a week later that energy has traveled to the coastline where, with an accommodating tide and wind, the beach could very well be going off. The waiting and watching are part of it for me. Punching the clock 9 to 5, it pays to know ahead. Of course, being oblivious has its advantages too. When you roll up to the beach without any idea of the conditions and it’s firing, IT’S JUST LIKE CHRISTMAS MORNING! Following the storms, the swells, the tides, the local winds and knowing the local topographic elevations and the bathymetric depths gives you a feel for how you spend the weekend mornings or maybe the glass off would be better so you spend the morning drinking coffee and watching the kids play soccer. That’s surfing. Enjoying the smell of the coastal sage on an early morning walk into Trestles. Sitting on the sand, watching the local surf school kids riding arguably the worst surf craft in the worst possible conditions whilst still completely stoked. That’s a level of surfing I still aspire to. Surfing three waves to the beach so I can advance to the next round of heats, that’s not surfing and for me, has all the allure of competitive picnicking. So the magic came to me as a release of all the attachments of the surf industry complex and a return to the simpler things: the beach, the surf and the water. I really like to be in the water. If I can float around inside and pick off a couple of heaving screamers in the shore pound, so much the better. KM - Your blog, 23 Breaths is great. As the author/moderator you go by the moniker, Pranaglider a name that fascinated me from the first time I heard it. So, I looked up Prana and found it to mean, As one who devotes oneself to knowing and cultivating your Pran. So what is Pran to you? And, what then is Prana? Bruce - By definition, I found Prana is the universal sea of energy that infuses and vitalises all matter. It appears to be a sea of energy that somehow turns into sub-atomic particles, which become the building blocks of all matter that makes up our physical world. Prana is a Sanskrit word, translated as Vital Life Force. So by understanding what Prana is and how it works would it be like being given a key that can unlock new inspired health and well-being levels, both inside and out. Perfect for mat riding! KM - How did you come up with all this and how does it relate to riding mats and riding waves? Bruce - I got into yoga in college. It’s great exercise and great for surfers. As one delves into yoga you start with the physical poses that are known as the asana. Then one day, your teacher says “You know what goes really well with all these asanas? Breathing!” So then you get into combining the asana movements and the breathing. Then your teacher says, “You know there is a whole science of breathing called Pranayama.” There are ratios of inhalations to exhalations, breath holding etc. The word Pranayama is a combination of Prana or life force or breath and ayama which means restraint or control. So at some point in exploring pranayama it occurred to me that I was filling my mat with Prana. That is how I started calling my mat a Pranaglider. About that time, I was looking for a pseudonym, so Pranaglider came to be. KM - Well then, onto 23 Breaths. How did you come up with this blog? And what does 23 Breaths mean? Bruce - The name 23 Breaths is 5 different jokes happening at the same time, so this will take a while. Put on the kettle and pull up a chair. My professional career has consisted mostly of sitting in front of a tube connected to a keyboard. Typing away, answering emails, sending emails, writing computer code and fixing computer code. As punishment I was asked to write the training materials, quick guides and project proposals. So lots of writing but never anything I wanted to write. Nothing fun. Nothing even vaguely poetic. I will admit to being a voracious reader. College gave me a lot to read, mostly the dry technical manuals every programmer depends on. After all that was properly sorted I descended on the local library like a herd of locust. I augmented that with Amazon and the local bookstores. Lots of philosophy, physics and poetry, areas I was never really interested in before but it seemed to balance out the dry tech manuals. Or maybe it was just spite… So there I was just sitting there with all this stuff in my head, a happy blending of 10 different thought streams, with nowhere to go. Then blogs came along. I found my outlet writing these daily diaries of whatever was going on. Some local guys (Jason Hall) were taking pictures which helped in no small way. If it was flat, I wrote about flatness or maybe an epic swell. If I made pizza, then that would be in there too. If nothing came to mind I would find an interesting surf photo and riff on that for a couple of paragraphs. All this was happening about the time I was getting into mats (I had a couple of other blogs and guest wrote or ghost wrote on some others) so a mat centric blog was in order. I had been reading a book by Robert Anton Wilson (The Illuminatus! Trilogy) in which the number 23 was prominent. The Breaths part relates back to the pranayama exercises I was doing. It also touched on two key items in mat riding. First, How much air do you put in the mat? Interestingly enough, 23 breaths is the wrong answer. Second, the true beauty of the mat and the real answer to the first question is that inflation is variable. James Sowell taught me everything I know about inflation. He let me ride his mat once and then it all made perfect sense. So I blow it up a lot and as soon as you get in the water the gases cool and the mat deflates. If the waves are big I swim outside and then inflate. I usually take a few waves, then adjust by 2 or 3 breaths to dial it in for the day. KM - Mat surfing is such an underground ocean experience with a fairly small, but growing following. Do you think it is growing too fast? Bruce - There is no chance of mat surfing growing too fast. The numbers just aren’t there. That said, every time I go to get one of Graeme’s body bags, he has already sold out. So I could be wrong. KM - What constitutes a good mat versus a great mat? Can you tell us about any of your great mats? Bruce - The difference between a good mat and great mat is the rider’s attitude. Always. Mats are the most advanced wave riding vehicle on the planet so the rest is up to you. I keep a Kmart red and blue mat in my car just to remind me of how great the handmade mats are. KM - What do you look for in a surf mat? Bruce - I like them to be quite malleable. KM - - Have you seen a mat you really want to try out? Bruce - I would like to ride them all! I really like the colors we are starting to see. KM - About when did you start riding mats in this near new era of lightweight mat construction? What was the trigger that got you going? Bruce - I need to back up for a minute for that story. I had surfed from when I was eight until I was twenty-eight. (a little bit longer but this makes the math easier) When my wife and I started having kids I stopped surfing. It just didn’t seem right to take off to the beach and leave her changing diapers. But five years and three kids later I took the kids to the beach and was looking at the waves and thought That still looks fun! When I quit everyone was riding single fins or maybe fishes. When I started up again everything was tri fins. So I got a few and had a good time. Then longboards came in again and I rode those too, mixed in with the short boards. So I was OK with any kind of surfing device. With the kind of work I do I have always had access to the internet, user groups, Netscape, AltaVista search engines and so I blame Swaylocks! (www.swaylocks.com). It was a very active user group and they had a surf mat section and I came across a guy selling one of Dale’s mats. He was a military man and was stationed in California and was being moved somewhere and wanted to get rid of the mat. I forget how much I paid but I got that mat and it opened up a whole new world. Although really it just It simplified my whole surfing experience, got rid of everything that wasn’t pure stoke. Serendipitous indeed! KM - Pete D’Ewart told me a story recently about matting with you in Huntington Beach. He laughed saying you showed up with a mat that had this new grip on it that looked like a roofer just shingled his house and then was blown away at how well it worked, he just had to put it on his own mat. What is that all about? And do you experiment with toppings? Bruce - Pete’s always such a blast to surf with! Great taste in music too. That mat Pete’s referring to is one of Dale’s. Awesome mat and I surfed it to death. It’s still around here somewhere. So I surf a lot of shore break with a lot of sand involved so the mat and I both get sandblasted every go out. The grip gets smoothed out and I would keep adding another layer to get more texture. It did get a little heavy but when you adjusted the inflation it didn’t seem to affect performance at all. I had Paul make me a blue streak that I added grip to. I have always wanted to mix the available grip colors and get real psychedelic. All that said I usually grab one of Paul’s canvas top mats and go. KM - Did you ever ride mats as a youngster? Bruce - Absolutely! You had to drag those hyper inflated suckers out thru big walled up south swells until you got outside or a big one grabbed you and then it was a superfast trip to the beach. I slept well those nights! KM – Did you grow up surfing, kneeboarding, riding boogs. etc., and where did you ride your first wave? Bruce - Anything that floated and some that didn’t. Tom Morey didn’t come up with the Boogie until 1971 and I was a stand up surfer by then with a leash so that cut down on the exploration. KM - Where did you grow up? Bruce - My parents moved to Huntington Beach in 1961. My dad was an engineer in the space program. HB was mostly agriculture then but tract homes grew just as well as celery and the profit margins were better. KM - Where did you go to school and/or college? Bruce - Marina High School, then I did the surf team tour of Golden West and Orange Coast Junior Colleges. After I got married, I went to UCI (University of California at Irvine) I was trying to get a Computer Science degree but the school was full. So I studied Math and graduated with a degree in Economics. KM - Where did you learn to surf and on what type of equipment? Bruce - The closest beach to our house was at Warner Street and PCH so I’ll have to say that but at the time hitchhiking was not as dangerous (it probably was but one of the advantages of being young and stupid is that you don’t consider all of the possible outcomes) so we surfed anywhere from Seal Beach to Laguna depending on the swell and the ride. The type of equipment varied quite a bit. Early on I definitely remember riding pieces of plywood we found floating in the shore break, Paipo like. I’m still picking splinters out of my belly. Bodysurfing was always an option, sometimes with fins, sometimes without. If you had a buddy with a pair you would share. We used shoe laces as fin leashes. I remember having a piece of pine that I had shaped like my brothers surfboard and painted with some house paint. Anything to be in the water. We used to rent the blue mats with the yellow bumpers at Huntington pier for the day. 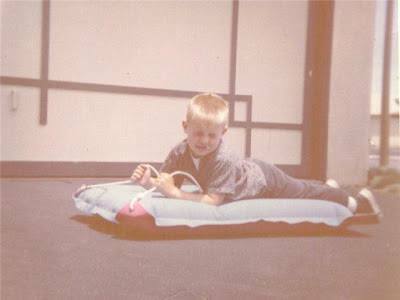 I eventually got one of the red and blue canvas mats and rode that for a while. My older brother Bob had a surfboard so that’s what I really wanted! But since surfboards were maybe 100 bucks new, my parents weren’t going to go out and buy me one. You know how kids are - they want everything they see. So I spent some time riding anything and saving my money. My first board was a homemade job someone had put together. Making your own board was real common then. That had to be in the late sixties because the first thing I did, I should say we did because my brother and I stripped the glass off the blank and cut it in half to make some kneeboard / belly boards out of it. Mine had a drawn in tail and not much rocker. Foiled like a displacement hull. Bob’s was the nose section and looked like a Simmons with a wide square tail with parallel twin fins and a scooped out deck. I wish I had that one. I’d like to ride it now. So rode those and borrowed my friend’s boards. Surfboards dropped in size overnight and that helped. Fewer materials meant cheaper boards. It was a great time as everyone figured out how to make a short board that worked. Huntington had a lot of surf shops downtown. John Severson, Bruce Brown, Drew Kampion, Macgillivray Freeman, ER and ING defined my universe. It was heaven. KM - Tell me about your first wave?. Do you even remember it? Is there any one wave that has really stuck out in your mind? It was 1974 and I was at Uluwatu, Bali, Indonesia. This was when you had to walk a couple of miles with your board to get to the cave and then down the ladder to the beach. The swell had picked up so instead of my 6’7” I brought the 8’6”. We get there and start the paddle out. John Silver was on a regulation 9’0” Brewer gun and I was riding an 8’6” John had shaped for me. The waves that we thought were the sets turned out to be just another swell just filling in between the real sets. Now to completely understand my predicament you have to understand that growing up in the OC, it doesn’t get anywhere near as big as it was that day. John Silver and I were paddling out together and this giant set comes in and I’m shitting bricks. We are paddling for the horizon with all we got. John had about 20 feet on me (gotta love the Brewers) and took the first wave of the set on the head. It broke his leash and mangled me a bit. I paddled over a couple of more waves and then turned around and took off. I wish I had a mat on that trip! KM - Where is your go to surf spot to mat? How do you handle the crowds there? Bruce - I am partial to the local, wildly polluted rivermouth. It’s all shore break around here with shifting sandbars so it moves around a lot. Usually there is an outside break and then an inside which is sometimes better than the outside. If the outside isn’t connecting all the way through you can get your fill of good ones. Depending on the swell, tide and the crowd I surf a place I call Outside in the Middles. KM - Do you get your share of waves? Bruce - I have surfed so many waves at this point that I don’t really think about my count any more. A nice day in the water is always fun. KM - Where did you learn your technique? Was there a mat mentor or just trial and error? Bruce - I watched GG videos and surfing with Mattitude helped a lot. It’s very subtle movements so watching does help as much as just surfing as much as possible. I still like to surf my stand up quiver, nothing sadder than a dusty surfboard. KM - What is normal and comfortable to you in regards to inflations and how often do you adjust? 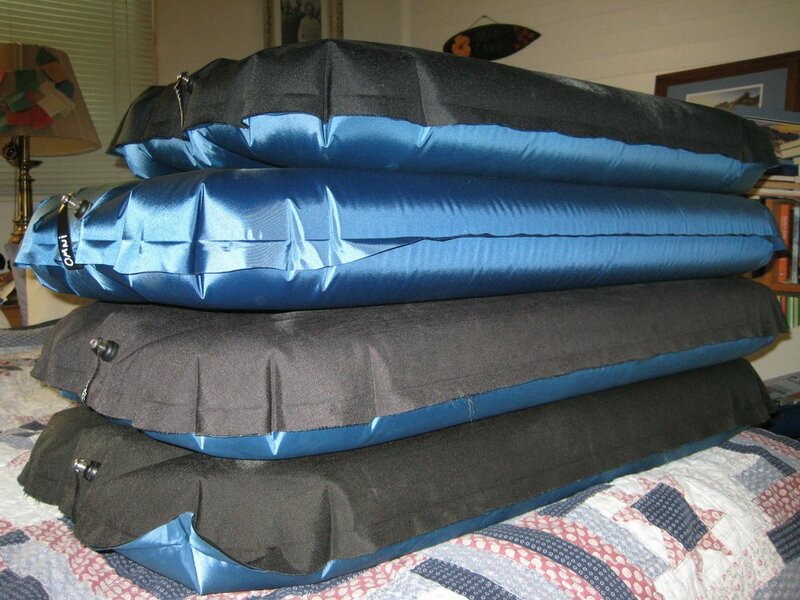 Bruce - I think that the versatility in being able to vary inflation is my favorite thing about mats. I adjust a lot, occasionally while I’m setting up for the inside. It’s incredible to be able to change the shape of your mat on the fly. I start with, wait for it, 23 Breaths. (I’ve been waiting pages to work that one in) and then I adjust as I go along. If you think of a large mat fully inflated as a longboard, then as you drop the inflation they get looser like a good shortboard. So I adjust the mat to fit the waves. Bruce - My quiver isn’t that big to have all of those variables. I am going to work a clause into my next contract that requires a mat caddy at my command. Seriously, that sort of A-B testing is what Paul and Dirk do. KM - Do you think lighter is better in a mat? Or, do you prefer shorter maybe, longer, narrower? Bruce - I’m sure it matters. I think it really is matching the rider with the mat and the conditions. KM - What is your go-to mat currently? Does it depend on conditions, inflations, tides or maybe crowds on what mat you ride? Bruce - It totally depends on conditions! Paul made me a blue streak that I’m fond of but I try to ride them all. They adjust so well it’s hard to go wrong. KM - What’s in your quiver? Bruce - A couple of Dale’s and a bunch of Paul’s. KM - How fast do you think you have gone, realistically? Have you seen top end speed yet in your career? Bruce - I usually run out of wave before I hit top speed. KM - Have you ventured much into the fourth gear range as far as speed goes? Bruce - The waves are shorter here so probably not. The Rincon guys have probably gone faster in those longer waves. KM - What fins are you using currently and why? Bruce - I have several sets of duck feet. XL’s for the winter when I wear booties and the larges for summer when I wear fin socks. I have wide feet and they fit well. I also like the longer blades. That said I like to try new fins. Like wetsuits, fit is everything. KM - Do you want big, nasty chewing waves to ride or are you out for the Zen like waves? As Miki Dora once said, I’m a four foot and under guy. Bruce - Size doesn’t matter. I like good conditions. But there aren’t any big waves around here other than the Wedge. Those guys are crazy. At this point I don’t heal as fast as I used to, so good four foot and under is great. Long waves are probably optimal for the mats. I remember surfing Malibu and thinking “I wonder what my wife will say when I come home and say, Sweetie we are moving to Malibu!” Crazy I know, but you can have thoughts like that on a long wave. KM - Maybe take us through your dream mat wave, without divulging too much about where it is. KM - I’ve found that since we last rode together, mats, and their designs, have subtlety subtly changed, at least for me. Bruce - Paul and Graeme are constantly coming up with subtle refinements. It reminds me of the sixties when big wave riders were also shapers. Brewer, Downing, Noll, Curren. Paul and Graeme are probably better qualified to speak to that point. But I can say that it’s a great time to be a mat rider. KM - What’s different and what’s the same? Bruce - The designer / builder makes a mat that has a certain “potential shape” and then the rider fills it with a variable amount of air and reshapes that volume as the wave progresses. Those little changes in shape and variations to the free breather shape are what’s happening now. KM - How has the mat world changed over the last five years with the push of social media? Bruce - It’s certainly easier to find out more information on the net. A google search for Surf Mat returned 35,400,000 results. Blogs have come and gone, having been replaced by commercial sites which mirror the rest of the web. We have organized a few mat meets online and the Hand Plane Hoedown goes down with some regularity. So it’s easier to get a mat and find someone to surf with if that’s what you’re interested in. KM - Have you ridden or tested anything else, regular surfboards, kneeboards, standup paddle boards? KM - Do you lose your mat much? KM - Do you swim out with a limp-towel mat because the paddle out is so austere? Bruce - If it’s big, then definitely. Just enough air so that it floats and I can find it if it gets ripped out of my hands. Dale designed a harness the deflated mat attached to so once you were outside you could inflate it. Brilliant. That would be great here in the OC where there aren’t any breaks or channels. KM - I understand Graeme sent the G-Mat known as the Phileas Project out last year . Did you get to ride it? If so, How was it? Good, great, shithouse? What did you think of the overall premise of this nomadic wayfaring mat being sent all over the world? Bruce - I did get a ride and it was fabulous! The premise is some of the best marketing I’ve heard of, and if there was ever funding it would make a great movie. Bruce - They all have unique and individual properties, so I like to ride other mats. Lots of fun! KM - How about speed? How do you approach and define say the 3rd and 4th gear mentality? KM - How would you personally like to see it portrayed in the media. I mean, of course it isn’t as big as surfing, or boogs or SUP’s which are still growing by leaps and bounds. I mean surfing is in the Olympics, California is trying to make surfing the official state sport, and of course crowds are another factor. Bruce - I’m in the surfing isn’t a sport it’s a lifestyle camp on that topic. Picnicking isn’t a competitive sport because the objective is to enjoy the day. The same with surfing, no matter the surf craft. KM - What are your thoughts on the future of mat surfing? Bruce - Sadly there is, as they say in the biz, NO COMMERCIAL POTENTIAL. Mats will continue to be made by craftsmen and craftswomen who love to ride them. Just like it always has been. KM - You’ve been riding mats for quite a while.. What do you think of the new era in mats and riders, say in the last ten years? Bruce - I think there are a lot more things you can do on mats that I’ve never thought of. I’m looking forward to what the new guys come up with. KM - Are you in contact with other mat riders? Bruce - A few. Jonathan Jarret is awesome and creates unreal stuff. James Mattitude Sowell is up here and is always up for a surf. Matt The Big Hippy Pierce is surfing or fishing every day. Mary Mills, Glenn Sakamoto, Thomas Threinen, Ed Lewis, Kipp Denslow, Steve and Cher Pendo. It’s really amazing how nice these people are. They like to go surf and have fun. BTW if Jonathan and Pendo ever got together the surfing world would change dramatically overnight for the better. Like getting too much plutonium in a room. KM - Where do you see yourself in the next two years with your mat surfing? Bruce - I surf in one of the most crowded areas of Southern California, but I surf alone. I surf it like it's an early 60's longboard, lots of soul. Maybe not that exciting to watch, but I am having a blast! As much fun as those first days as a super stoked gremmie in the shore break at Huntington. I hope to, someday, be a part of the mat revolution. Faster, more turns, more "total involvement". But right now it's like the 1950's or early sixties and I don't see another mat rider for miles, and if I saw someone with a mat I would pull my car over and chat because I either know them or I share something very important with them.